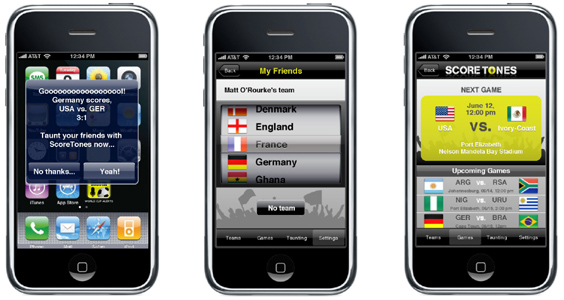 We may not know who won the World Cup yet but we launched an iphone app this week that screams “Gooooooaaaaaal” every time a team you follow scores. You then get a push notification that tells you the score and gives you the option to taunt a friend by posting a message to their facebook page. Get it here before the cup is over! The six week turnaround time was tighter than tight but FIFA wasn’t about to delay the start of the Cup just because we would have wanted more time to design, develop and test. This is the first of a series of apps that we will create under the brand Scoretones together with a great team at McCann Worldgroup. One more note on taunting: there is an amazing amount of mobile traffic that occurs during real-time events tied to specific event details such as a goal. The volume of TXT traffic during the Cup games has been written about on Flowing Data. We’re looking forward to parsing our own data for trends in a few weeks. On that note here is another post, this time showing water usage during the Olympic Gold Medal Hockey Game of Canada vs. USA. Water usage? Yes, every period end was punctuated by a spike in water usage attributed to millions of Canadians peeing simultaneously.